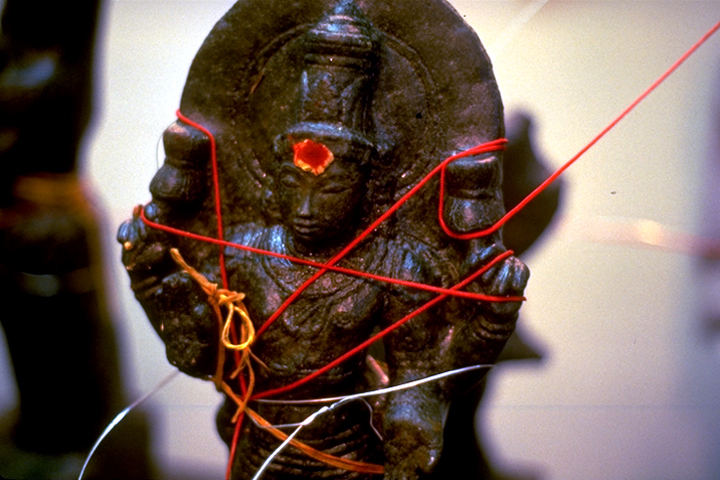 The stone images of the Hindu gods that are enshrined in America’s temples come from India. Those of white marble are usually made in the artist colonies of Jaipur in Rajasthan in North India, while those carved of dark granite come from the studios of Mahabalipuram in Tamilnadu in South India. Whether white marble or black granite, the stone has been carefully chosen by the ritual architects who mark and measure each slab for carving, a process that brings forth the Divine image concealed within. 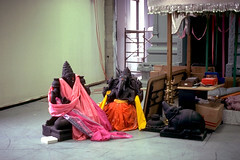 When the images arrive in huge packing crates on the shipping docks in New Jersey or Galveston, they will be transferred to the temple site and treated with care. Until they are fully consecrated, however, they are still but stone. The transformation of an image of stone to the embodiment of the Divine is a critically important ritual process. 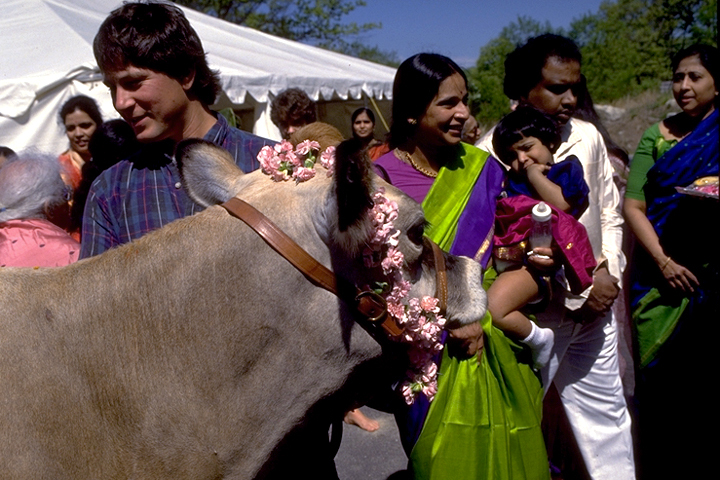 Undertaking these rites is a major step, requiring Hindus to make a permanent commitment to the temple and its roots in American soil. If, for example, a community has not yet consecrated its deities, the priest may offer prayers of invocation when they gather, bidding the Divine come and be present for the period of worship and then giving the Divine leave to go at the end. After they build a permanent temple and undertake the rites of consecration, however, the image will become imbued with the permanent presence of God. Once this is done, a priest must be in residence to offer honor, praise, and hospitality to the Divine guest every day of the week, every week of the year, from that day on, whether anyone else is there or not. Just as the temple is consecrated through the rites of kumbhabhishekam, the “sprinkling with sacred water,” so is the image. The sacred fires are kindled and the presence of the Divine invoked into the fire and water pots. Meanwhile, the image is purified in preparation for the consecration. It is placed in a large tub and immersed for one night in water, another night in grains, another in flower petals. During this period of consecration, the image may be ritually bathed by the laity of the temple, the first and only time anyone other than the priests will be allowed to approach the divine image directly. Two rites are always critical to the process of divine embodiment: the eye-opening and the establishing of breath. In the eye-opening ceremony, the craftsman carves the pupils of the eyes on the granite image, ritually opening the Divine eyes. The term darshan is central to Hindu worship, meaning literally “seeing” the Divine image. One goes to a temple for darshan—to see the image and to be held reciprocally in the Divine gaze. The first moment of Divine sight is said to be extremely powerful, so powerful that no mere mortal could bear the impact of the Lord’s gaze. Thus, when the eyes are opened, the priest places a mirror before the face of the God, so that the first gaze falls back upon itself. Even those who first enter the sanctuary for darshan of the deities are instructed to look first at the Divine image in the mirror, and only then turn one’s eyes directly to the Lord’s face. When the eyes are newly opened, the priest leads a cow into the sanctuary to be the very first auspicious recipient of the gaze of the Divine. Next, the sight of the God falls upon auspicious, young virgin girls. In the Boston temple, the schoolgirls who participated each received a Susan B. Anthony silver dollar as part of her prashad for this important role in the eye opening. The second rite is the “establishing the breath” (prana pratishtha). In a general sense, the whole sequence of consecration rites imbues the image with the spirit or breath of God. More narrowly, however, this rite takes place on the final day, after the image has been moved into place in the sanctum. The Divine presence is invoked in prayer at the fire altar outside, and the power of the Deity is transferred ritually through silver or gold threads that have been strung from the fire altar to the image. Once the breath and eyes of the Divine are ritually established, the image of stone becomes for the worshipper the bearer of the spirit and the sight of God. At the culmination of the elaborate life-giving ritual, the water in the kumbhas, now containing the power of the mantras that have been chanted, is poured lavishly over the images. Along with this water, the priests pour gallons of milk and lustrations of honey, yogurt, and sandalwood paste. This is the first abhishekam, or “ritual shower,” of the many that will be offered, weekly, from now on. According to Hindus, the Divine, of course, does not dwell in stone images alone, but is omnipresent in the universe. Hindus say that the Supreme Being, the Lord, has graciously condescended to dwell in the image, becoming intimately present in the world of families and communities. The consecrated image becomes a window opening out toward God. And the daily discipline of rites and offerings enables worshippers to cultivate and refine the arts of hospitality, honor, and praise which they offer to God who has become present among them.